The U.S. Patent and Trademark Office on Tuesday issued Apple a patent for a touch pad that removes the traditional "clickable" integrated button, replacing it with four or more force sensors and an actuator to provide tactile feedback. According to Apple's U.S. Patent No. 8,633,916 for a "Touch pad with force sensors and actuator feedback," the operation of a trackpad with an integrated switch-type button can be mimicked and improved upon with force sensors. Press and release operations, for example, can be easily discerned with the proposed method. Apple's MacBooks currently feature an integrated button, or "all-in-one," design. In this layout, a user initiates a button press by pushing down on the trackpad's surface, at which time a hinged mechanism located at the rear edge of the touch pad allows movement of the front end. The front edge is coupled to a switch that produces a clicking sound when actuated. There are a few issues with the existing design, including the increasing pressure required to activate the switch when a user's finger moves further toward the hinged edge. The physics of integrated button layouts, Apple notes, may degrade user experience in terms of touch pad sensitivity and operation. 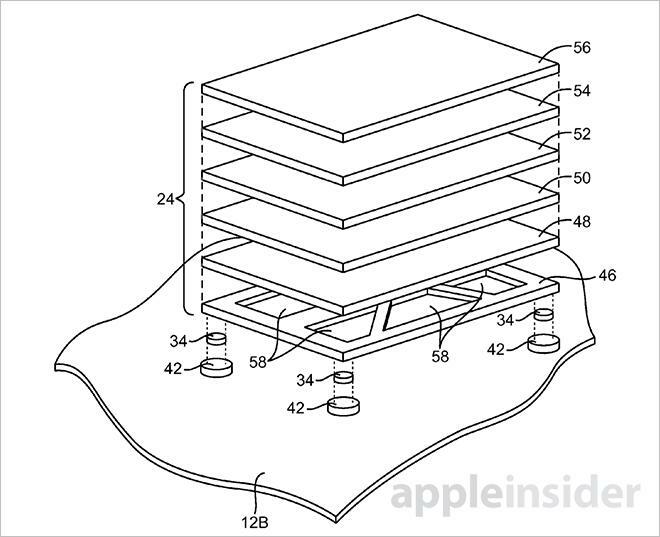 The patent instead offers a solution that incorporates at least four force sensors deployed at the four corners of a trackpad. In some cases, the sensors may be piezoelectric materials manufactured from polymer-metal composites or polymers filled with nanoparticles, which generate voltage proportional to the amount of compression. Alternatively, output may be measured in changes to inductance, magnetism or other force-dependent properties. As for the touch-sensing surface, multiple methods are mentioned, including surface acoustic wave and light detection technology. For the purposes of illustration, the invention focuses on capacitive touch sensors as currently used in the MacBook lineup. By using force sensors, the mechanism can be used to perform button-type operations without the drawbacks of an integrated button design. For example, a touch pad using force sensors does not necessarily need to pivot in any one direction. In some cases, the touch pad may not even need to move as an attached actuator can provide tactile feedback through vibrations. Further, force pads save room in a MacBook's cramped chassis, allowing designers to utilize space normally reserved for the trackpad's pivoting motion. As noted in the patent, a normal piezoelectric force sensor may be displaced less than 0.05mm under the most forceful of button presses. Apple takes into consideration user experience for those accustomed to feeling a trackpad flex or move when in operation. An actuator can be attached to the touch pad and programmed to relay a force to the surface that mimics a button press. This force feedback, or haptic feedback, may be extended to include a clicking sound, which in some embodiments can be reproduced by system speakers instead of the actuator. Using force sensors also has operational benefits over traditional systems. For example, the combination of force sensor and capacitive input can be used to facilitate easy one-handed drag-to-select functions. Since there are at least four sensors disposed on the pad's four corners, each can be mapped to a particular software operation. In addition, the sensors allow for granular levels of pressure measurements and thus control. Further, input or force application events measured by the sensors can be averaged to better determine what a user intends with a given press. The design is much more intuitive than the "on/off" capabilities of a traditional integrated button. 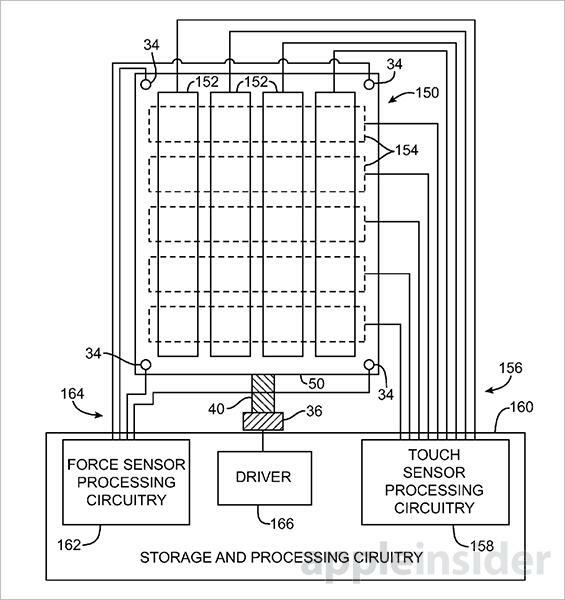 Finally, the force feedback capabilities of Apple's patented touch pad rely on one or more actuators that can vibrate or otherwise apply force to the mechanism. This tactile feedback can be induced by interaction with the touch pad itself, or through software triggers. An example would be feedback when an email is received. The remainder of the document describes configuration of the mechanism as well as alternative implementations in mobile devices such as the iPhone and iPad. 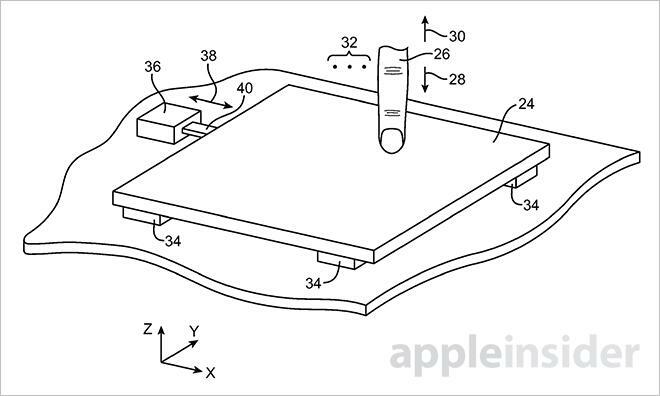 Apple's force sensor trackpad patent was first filed for in 2009 and credits Jeffrey Traer Bernstein, Avi Cieplinski, Brett W. Degner, Duncan Kerr, Patrick Kessler, Paul Puskarich, Marcelo H. Coelho and Aleksandar Pance as its inventors.